This is how we walk in the Whitney – OffBrand. 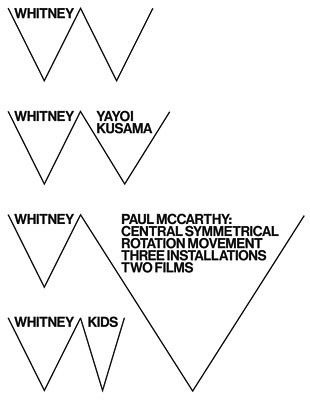 All the talk on the ‘blogs’ of late has been about the new identity of the Whitney by Experimental Jetset. I’m currently reading their account of it, while listening to a new arrival – This is how we walk on the Moon, by Johanna Billing (with design by Åbäke). This bit of grotesquely bourgeoise name-dropping isn’t entirely without reason, as it made me think about the critieria against which design has to ‘work’, and against which it is increasingly ‘judged’, in a very public way, by an audience on twitter and at the reductive idiots convention that is Brand New (and similar). While the new Whitney identity undoubtedly ‘succeeds’ against its own criteria, it’s been interesting seeing how many people have been enjoying reading the ‘great’ ‘concept’ and ‘rationale’ and explanation of ‘process’ on the Experimental Jetset website. Being written, as it is, by the designers, this will always be framed to explain how an end product makes sense in relation to the brief they were given by the client. I agree it is well written, and makes interesting reading, and the outcome undoubtedly presents a highly consistent, corporate, and business-like image of the Whitney as a contemporary art institution. But isn’t it more interesting to ask if that’s what an art institution (in the times in which we live) could and should be. Their own text doesn’t question (or reflect on) this, and in the identity, I don’t feel that anything is being challenged here. (I know it’s daft to make comparisons, but…) in contrast to the art-design work of Abäke (with its intriguing and sometimes confusing idiosyncrasies), I feel I want it to be more open to ambiguity, assimilation, augmentation and out and out assault (which may of course happen over time). The only concession to this comes in their sign off; “In the same way, we hope that future designers, working with the graphic identity we developed for them, will be able to use this identity as a platform for their own authorship – and to leave their own signature, their own fingerprint, within it. After all, a graphic identity could (and should) never be a machine, in which one simply ‘inputs’ an image and a title, and out rolls an invitation. It will always be a human process, in which the aesthetic and conceptual decisions made by the graphic designer play an essential role – a role that can never be skipped, or erased.” — But without completely abandoning at least part of the lengthy rationale that precedes it, I’m a bit unclear as to how this can happen. This is not a negative reflection on the designers, all of whom are excellent and working in specific contexts and responding to specific demands, or the work which I like in some ways, but on the forces that come to shape design work. And a request that if we’re going to reflect on design identity work, lets do that, not just concur that they made a good job of writing up their own rationale about it. And it also reminds me that I still haven’t written that Stedelijk post yet.